It’s been awhile since I’ve posted a recipe. During the week a friend asked for an easy cookie recipe to share. (Even though I prefer to call them biscuits, being Aussie and all!) I got these from one of the best ever cookbooks, “Fast and Fabulous”, written by Janelle Bloom. These bikkies have fast become a family favourite around here. My kids are huge PB fans, and these are so easy to make. The last time I made it I bought a large jar of peanut butter half price and doubled the recipe. They freeze well, so they have been lasting really well as an occassional treat. 1. Preheat oven 180degC. Line 2 trays with baking paper. 2. Combine peanut butter, sugar and egg in a bowl, stir with a wooden spoon until the mixture thickens (keep stirring until it does). Add chocolate and stir until well distributed. 3. Roll tablespoons of mixture into balls and place on prepared trays. Flatten with fingertips to about 1cm thick. 4. Bake one tray of cookies at a time for 12-15 mins or until light golden and a little darker around the edges (you can smell when they are ready). Allow to cool on trays for 10 mins then transfer to a wire rack to cool completely. *Variation: For macadamia white chocolate cookies, reduce the white chocolate to 100g and add 100g roughly chopped macadamian nuts. 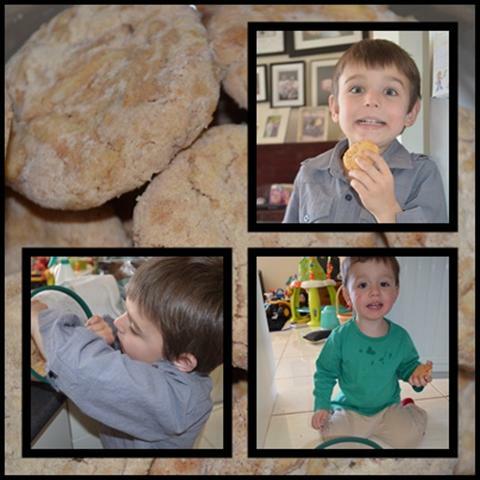 This inspired me to make peanut butter cookies with my boy!! I didn’t have any white choc chips, so couldn’t try out this recipe, but next time I go shopping I’ll make sure I have everything I need!